Hikers can explore 1.5 miles along this wild river and see evidence of a time when the stream and its surrounding area were not so wild: traces of a dam, extensive stone walls, and an intact house foundation. 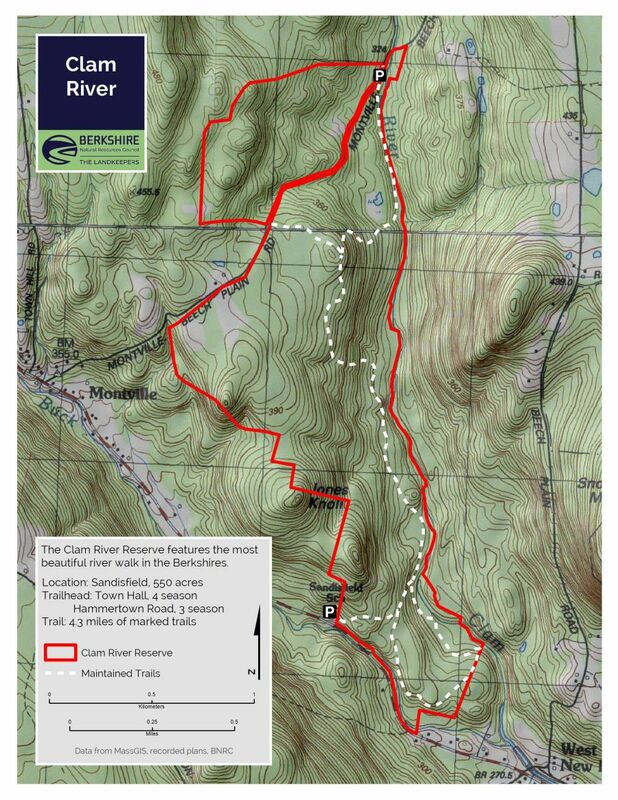 The 550-acre property offers three connected trails of 4.3 miles with moderate change in elevation. Special features: Beautiful, romantic stream valley, canyon-like in spots with access to Clam River. Old stone foundations and millworks along this cold water stream. Abundant wildlife. From Pittsfield: Take Route 20 East through Lee. After passing under the Mass Pike, turn right on Route 102 and then take an immediate left onto Tyringham Road. Continue straight across Route 23 onto Town Hill Road. Follow this until it intersects with Route 57 in Sandisfield. Turn left onto 57, heading east. Continue on Route 57 for 1.5 miles and park on the left at the Sandisfield Town Hall Annex, which is the former Sandisfield School. Enter the woods at the east edge of the parking lot. From Pittsfield: Take Route 20 East through Lee. After passing under the Mass Pike, turn right on Route 102 and then take an immediate left onto Tyringham Road. Continue straight across Route 23 onto Town Hill Road. Follow this until it intersects with Route 57 in Sandisfield. Turn left onto 57, heading east. Take the first left (it’s immediate, almost a U-turn) onto Hammertown Road. Continue for about 1.5 miles and park on the right in a small lot just before the Clam River bridge. The trail begins at the BNRC sign. Exploring the Clam River Reserve—for an hour, a morning, or a day—rewards you with another Berkshire experience of what is wild and untamed in the County and with a perspective that reaches back in history and forward to the future. Clam River Loop: From the Town Hall, you can access the Clam River Loop Trail. A 0.2-mile spur from the trailhead leads through a hardwood forest to the Loop Trail. The 1-mile loop follows old wood roads and new-built trail through hardwood, white pine, and hemlock forests. Total length of the spur + loop + spur is 1.5 miles. Clam River Trail: The Town Hall trailhead also provides access to the out-and-back Clam trail that parallels the River. From the Town Hall Annex to Hammertown Road and back is 3.3 miles. Most of the trail follows wood roads; stretches of new-built trail detour around wetlands. The trail runs along the Clam River, eventually bearing away from the river and climbing northwest past an old cellar hole, ending at Hammertown Road. Hammertown Loop: From the Hammertown Road trailhead, new-built trail follows the river downstream for 0.5 miles. This might be the prettiest section of a very pretty place: most of the trail is on top of steep banks overlooking the Clam River with a dense canopy of hemlocks shading steep, rocky banks. Departing from the river, the trail climbs 0.25 miles to the foundation of what must have been an imposing residence. Soon after the cellar hole, a wood road leads back to Hammertown Road; turn right and follow the Road down/north to the trailhead to complete a 1.6-mile loop. A tributary of the Farmington River, Clam River gets its name from freshwater mussels—not actually clams—that make their home in the river. This 550-acre preserve protects 1.5 miles of the Clam, protection that the river did not have in centuries past when settlers harnessed its power to run mills. Visitors can find evidence of that primitive engineering on the river. Further away from its banks are the long stone walls of likely sheep farmers and a house foundation with an unusual feature: an enclosed, covered stone structure in the middle of the cellar. The foundation is on the Hammertown Loop. In 2014 a large clearing on the south/east side of Hammertown Road was created. 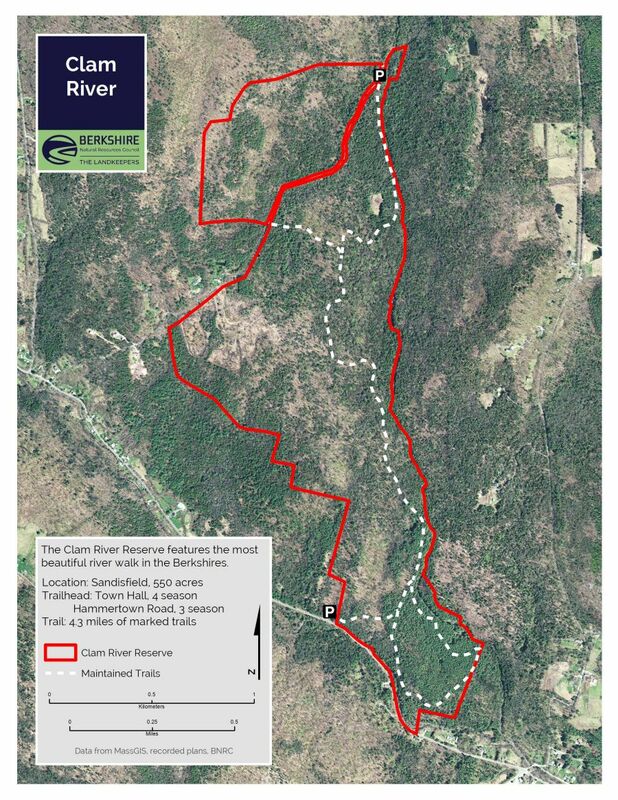 With a goal of creating habitat for the endangered New England Cottontail and other young-forest species, BNRC cleared 24 acres of mature forest. As the forest grows back, the bird-watching and hunting should be excellent. Trace paths into the clearing can be found by adventurous hikers. The name Sandisfield is a tribute to Samuel Sandys, the first “Lord of Trade and the Plantations.” The largest town in the Berkshires at 53 sq. mi., Sandisfield is also the most sparsely populated with about 900 full-time residents. The past left a strong footprint on the landscape in the form of cellar holes, foundations, orchards, and stone walls. These parcels are representative of historical land use patterns for this corner of New England. In the 1700s, early settlers of Montville and Beech Plain cleared fields, built sturdy cabins, planted crops, and eked out a living from the rocky soils. In the 1800s, tanneries and mills, powered by the Clam and Farmington Rivers, supplemented the huge logging industry, and farms and families prospered. The many stone walls here attest to livestock husbandry that peaked from 1810 to 1840 with the craze for raising Merino sheep. With the collapse of the wool markets and the lack of any railroad serving the area, farmers moved west to better soils. Many of those who stayed raised chickens. In the late 19th and early 20th century, a philanthropist brought many new York-based Jewish families who had emigrated from Eastern Europe and helped them get mortgages on failed farms. Look around for orchards near the foundations; the apples from these orchards were widely used to make hard cider – a welcome relief on a long, dark winter night.